Simple and satisfying, chestnut ice cream is my contribution to my summer ice cream event! I am growing increasingly fond of chestnut as a flavour. A versatile nut, chestnut can be eaten candied, boiled or roasted. Another important use of chestnut is ground as flour, which can then be used to prepare bread, cakes and pasta. My favourite chestnut recipes include roasted chestnuts, marrons glacés and chestnut cake. The ice cream I describe here tastes of pure chestnut. The recipe calls for less sugar because the chestnut spread used as an ingredient is very sweet. Chestnut puree can be used instead; however, the quantity of sugar will then need to be increased. I decided to use chestnut spread partly because it contains glucose, and glucose helps create a smoother (less icy) ice cream that tends to last longer. 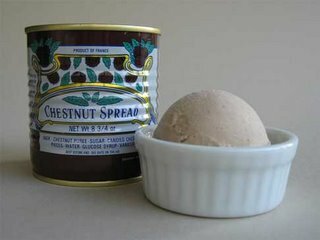 Sweetened chestnut spread can often be found in ethnic or specialty food stores. 1. Place cream and whole milk in a small saucepan. Bring to a rolling boil over medium-high heat, stirring occasionally. 2. In a small bowl, whisk 1/4 cup of sugar with the egg yolks until well mixed. Temper the egg yolk mixture with 1/2 cup of the hot cream mixture. 3. Once tempered, add the rest of the egg mixture into the cream mixture. At this point you can add the sweetened chestnut spread and mix until combined. Bring the mixture up to 85ºC or until it coats the back of a wooden spoon. 4. Strain the mixture through a fine sieve and cool. Let the mixture sit in the refrigerator over night or until completely cool, at least four hours. Posted by Sam at 3:29 p.m. This looks great! My parents love to eat chestnut paste out of the can, with sour cream and jam, so I bet they'd love this ice cream. I'll have to make it for them at some point. Thanks for your lovely comment. The chestnut ice cream was an experiment and came out better than I expected. Thanks again for your contribution to the ice cream event. Nice. I actually had an idea similar to this one at the restaurant I work at using chopped roased chestnuts, and chestnut honey. This looks positively delectable. Oh, mon mari would love this! I'll try it!! thanks!! I think it is a great idea too, must try it! Thanks for visting and for your lovely comments. Chestnut is just a yummy flavour. Hi!! My name is Izumi. It's so nice!! I like sweet chestnuts very much. I'd like to eat chestnut ice cream!! Thanks for the experiment! My grandmother has 2 chestnut trees in the back yard and every year I make chestnut puree to pour over desserts and add to homemade ice cream... I still hadn't found a recipe that highlights the flavor - but I just made this (its cooling as I write for our Thanksgiving meal) and flavor is WONDERFUL! I made a double recipe - and used 1/2 raw sugar and 1/2 brown sugar - and added about a 1/3 of a vanilla bean. You can add as much or as little milk as you like - thicker puree is great for filled chocolates or spreading on bread... this recipe is a bit thinner than that. If its too chunky, you can always run it through a blender. I was so happy to find this recipe on your blog (which is great btw). I recently purchased a marron glacé ice cream which was good but very expensive, and since I love making homemade ice cream I knew I could recreate it if I could only find a good recipe. I tried yours, and it's terrific--rich and creamy, and the chestnut flavor comes through nicely. Thanks for posting it! I just made this recipe, and it is awesome! The texture is very smooth, and the flavour is fabulous! I'm using the same brand of Chestnut puree you are using. The only thing I change next time is that I'll use a lot less sugar than even just 1/4 cup. Probably I'll just skip the sugar, because the chestnut puree is already really sweet. Thankyou sooooo much for your post, this is an icecream recipe I will certainly treasure!